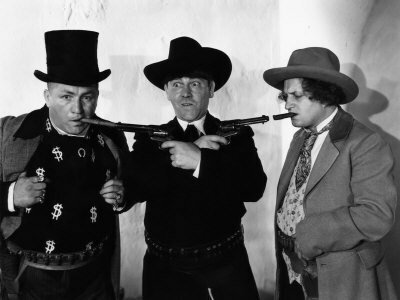 In Phony Express, the Three Stooges (Moe, Larry and Curly) are vagrants in the Old West, mistaken for lawmen, who have to guard the bank .. and once they fail at that, they have to capture the bandits and recover the gold … or else! 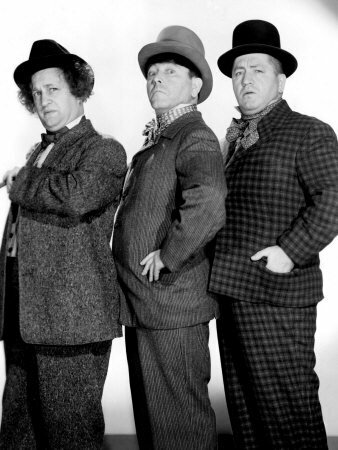 In Phony Express, the Three Stooges are wanted for vagrancy (50 cents each, or 3 for a dollar), but the people of Peaceful Gulch use their photograph from the wanted poster to run in the local newspaper, falsely claiming that they’re the famous lawmen Wild Bill Hiccup and his deputies, in hopes of deterring the gang of desperadoes that are running amok. The gang is led by Red Morgan, played by Three Stooges regular Bud Jamison. No sooner do the Three Stooges arrive in a town than they see a snake oil salesman, selling “Dr. Abdul’s Cactus Remedy”. Dr. Abdul has to leave and asks the Stooges to watch his covered wagon, telling them that they can keep any money they make. Rushing past each other, they spill and break the bottles of medicine, and Larry and Curly are sent to make more of the concoction while Moe tries selling. One of the Three Stooges best routines is when they mix a concoction without knowing what they’re doing, and this is one of their best examples. In the meantime, Moe mentions that the snake oil will cure lumbago, and the town’s sheriff wants a bottle! After trying to stall, Moe gives a bottle of the freshly-mixed concoction to the Sheriff, who wants to have them arrested. The boys flee in the covered wagon, but the Sheriff throws the bottle after them, and we hear the explosion off-screen. The Three Stooges make their way into “Peaceful Gulch”, brush each other off, and enter the saloon run by Red Morgan, where mistaken identity takes place. Red mistakenly thinks that Curly is Wild Bill Hiccup, and is scared stiff. This leads to some funny work as the boys try dancing with saloon girls, poking Red Morgan with their spurs, spilling beer on him, etc. Until Red realizes that they’re only vagrants, and challenges them to demonstrate their sharpshooting, which Curly actually succeeds in thanks to Larry’s (cheating) help. They accidentally knock out Red Morgan and escape. The boys are soon hired as guards for the bank, based on their success, but Red and his gang rob it regardless. Some excellent slapstick occurs as Moe tries to drill Larry and Curly with rifles, ending with Moe taking the punishment. Hearing an explosion, they run back to the bank, ignore the gaping hole in the wall (termites!) and break down the front door, and apprehend the “criminal”. The owner of the bank who has run in through the hole in the wall. Trying to prove their innocence, the Stooges try to track down the real criminals, using Curly as a bloodhound. After a false trail chasing down a skunk, by pure luck, they stumble across the villains’ hideout. After Curly accidentally backs into a bear trap, Moe gets inspiration, and the Three Stooges lay the traps outside the villains’ cabin and lure them into them. However, Red Morgan and one of his henchmen came in late, and Curly hides in the stove for safety. Red throws a lit cigar in the stove, heating up the bullets in Curly’s bandolier and firing them across the cabin, hitting the villains and ending the short film. Phony Express is an above-average Western Three Stooges short film and recommended. Phony Express is available on The Three Stooges Collection volume 4. Curly (Curly Howard): Hey Moe, buy me a bottle. I can’t sleep! Moe (Moe Howard): What’ya mean, ya sleep 12 hours every night! Curly (Curly Howard): Yeah, but I’m wide awake all day! Moe (Moe Howard): Ya lunkheads, ya broke all the bottles! Get in there and make some more while I do some spieling. Curly (Curly Howard): [pointing to the broken bottles] I think ya spieled enough already. Moe (Moe Howard): I’ll spiel you! Get going! Larry (Larry Fine): Do you know anything about mixing medicine, Doctor? Curly (Curly Howard): Why, certainly, Professor. All ya gotta do is mix a little of this and a little of that. Larry (Larry Fine): [holds up large bottle] Say, we’ve got plenty of this. Moe (Moe Howard): [handing a bottle of Larry and Curly’s concoction] There you go, Sheriff, that’ll pick you right up. Curly (Curly Howard): And lay you right down, too! Moe (Moe Howard): Why don’t you change that face of yours? You scare people! Moe (Moe Howard): [reading sign] Hey, “Porters Wanted” – it looks like you guys are going to work. Saloon girl: What do you say, Hiccup, shall we trip the light fantastic? Curly (Curly Howard): I’d rather dance! Bartender: [showing “wanted for vagrancy” poster] Red, look at this! I thought those guys were phony! Red Morgan (Bud Jamison): I’ll stop his Hiccup! Moe (Moe Howard): He scared it to death! Curly (Curly Howard): [looking at the gaping hole in the bank wall] Hey look, termites! And big ones, too! Larry (Larry Fine): [to Curly] Mush! Mush! Moe (Moe Howard): [as Curly is trailing a skunk] He’s got the scent! Moe (Moe Howard): [pulling stolen money from the hiding place in floor] There’s gold in them thar hills! Curly (Curly Howard): There’s gold in them thar floors, too! Moe (Moe Howard): [after rescuing Curly from a bear trap] I got it, the traps! Curly (Curly Howard): You mean I got it the traps! Moe (Moe Howard): Get the rest of ’em! Curly (Curly Howard): Shut yer trap!